Preheat the oven to 400°F. 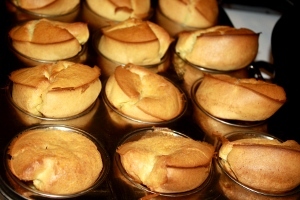 Place the muffin or popover pan in the oven to heat up. Use your food processor or blender for the best results. Combine the eggs, butter, and milk on medium speed until the mixture is uniform. Whisk the dry ingredients in a bowl. Add the dry ingredients to the wet ingredients, then blend at medium-high speed until batter is smooth. Grease your muffin pan and filling each cup about 2/3 full with the batter. Bake for 25 minutes, then reduce the oven heat to 350°F and bake for an additional 10 minutes, until the popovers are deep brown. Don’t open the door during the baking time. Turn off the oven, immediately pierce each one on the side, then leave them to “dry out” with the door ajar for 5 minutes to finish setting. Remove from the pan, and serve immediately.